As disturbing as the violence in the Orchard Towers video is, I'm more appalled by the online reaction that the man deserved to be beaten and stomped on. A typical comment: "Serve the arrogant ferrari driver right,we stand up for (sic) all this SNOBs, whack them if they like to act." This is wrong. No one deserves to be assaulted like this. Since when did Singaporeans become so bloodthirsty? Apparently, the attack was so vicious that at least two YouTube videos of the incident have been removed because they violated "YouTube's policy on shocking and disgusting content". And yet YouTube still allows Lady Gaga videos. According to various accounts, the fight started when a Ferrari almost hit a pedestrian at the zebra crossing. 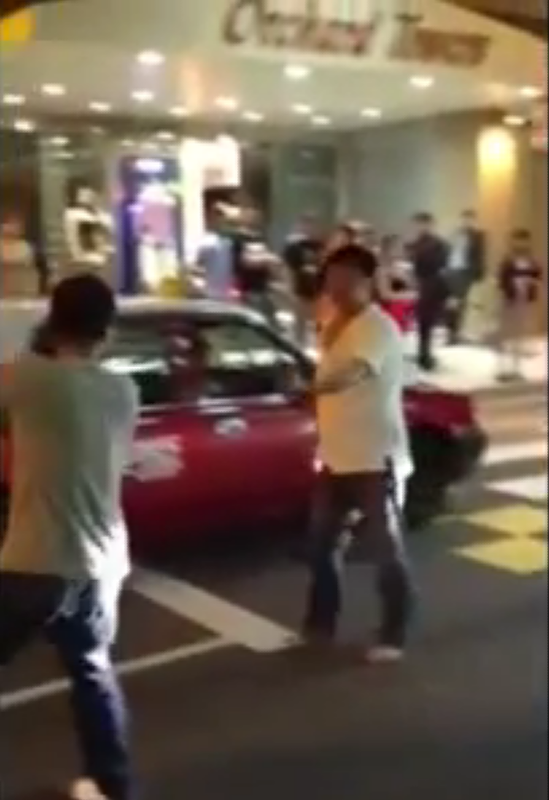 Stomp reported that the driver of the Ferrari got out of his vehicle after passers-by threatened him. In the graphic video, the man in white was seen coming down from the steps by the side of the road. The man then bent down behind the Ferrari, after which another man in red stood up from behind the car. It is not known if the man in red is the driver of the Ferrari. At this time, a youth clad in grey started spewing expletives at the Ferrari driver. The man in white then walked forward to the youth, who was being restrained by a female friend wearing a white top and jeans, and kept taunting him. The friend managed to pull the youth back but the man came up to the duo and started gesturing. The man and the youth then started throwing punches at each other. Three of the youth's friends came into the picture and started to surround the man, backing him into the wall. At this point, they were just next to Harry's Bar. Two more youths then jumped in and the entire group was seen raining blows on the man. One youth stood by the side and watched. The fight was over in less than 10 seconds when the man fell to the ground but the group of youths continued to kick and stomp at the man. At this point the man in red who appeared earlier stepped forward to try and help but was stopped by the group. The one-sided fight only ended when the youths were stopped and pulled away by their female friend. The clip ended dramatically with one of the youths shouting at the passer-by who filmed the incident to delete the clip. The video is now back on YouTube. 2014 UPDATE: Another fight outside Orchard Towers. Three arrested. Post by All Singapore Stuff.